Based on my impressions with the initial look at the Sentinel-2 data (see part 1, part 2 and the addon to part 2) here some overall assessments in comparison to Landsat. This is preliminary of course – based on the current state and how Sentinel-2 is operated so far and my limited experience with the data. But here is an assessment in a number of different fields i consider relevant for choosing a satellite data source. Which of the criteria listed are more important and which less of course depends on the use case. Data point quality refers to the quality of the individual data points (i.e. pixels) in the images, i.e. noise levels and radiometric accuracy. This seems to be excellent for both Landsat-8 and Sentinel-2. Data depth means the scope of information available for every point. Sentinel-2 might be considered slightly ahead because of the additional bands but the thermal bands of Landsat are a huge plus as well. The narrow red and green bands of Sentinel-2 might be an issue but likely not that major for most applications. No clear winner. Resolution – this obviously goes to Sentinel-2 for the 10m resolution in visual and NIR bands. Note however Landsat has the lead in the shortwave blue band with 30m vs. 60m. Image archive refers to the size of the archive of past recordings that is available for use. Here Landsat of course has a huge advantage and it will take a long time for Sentinel-2 to come even close in this area. Revisit frequency means how frequently images are recorded at a given location. Theoretically this is already higher for Sentinel-2 with just one satellite (see below for a quantitative analysis of this) and it will be significantly higher once two satellites are operational. Note however for practical use it does not matter if an image can be recorded every week if it is not. None of these satellites records data permanently and the recording frequency of Sentinel-2 right now is far from that of Landsat-8. It remains to be seen what duty cycle Sentinel-2 will be operated at in the long term. Coverage – this refers to what part of the Earth surface can be and is practically covered. Here Sentinel-2 has an advantage due to the wider swath recorded but actual acquisition plans exclude the Antarctic (although during current startup phase images from there are recorded). If at all it will only be possible to judge this in retrospect. Data structure/packaging – I covered the shortcomings of Sentinel-2 here in recent discussion. IMO the Landsat structure for Level 1 products is next to perfect although you could probably argue that it could be improved in handling releases of reprocessed versions of scenes. Data download performance/reliability – this is much better with Landsat at the moment. Ease of data access – both have their issues here but as i pointed out the ESA data access system leaves much to the desired, especially with the inaccurate footprints and the poor quality preview images. The unclear access to the long term archive is another possible issue for Sentinel-2. Metadata completeness – although i think Landsat provides nearly everything needed Sentinel-2 is clearly ahead here. License – both are open data but the vague attribution requirements are a possible issue for use of Sentinel-2 data. As said i will leave the overall assessment to the reader. A few more words regarding coverage, revisit frequency and the wider viewing angle of Sentinel-2: Currently Landsat-8 records about 720-730 scenes per day, which is likely about the maximum possible while Sentinel-2 takes 150-200 – which however is likely not anywhere near the operational maximum. These numbers are difficult to compare because the scene size is different and as explained in my detailed report Sentinel-2 packages sometimes start and end in middle so you can not assume a constant size. Still with a Landsat scene being 190 km wide and 180 km long and Sentinel-2 recoding a swath 290 km wide and scenes being nominally about 300km long that makes 24.8 million square km for Landsat-8 per day and Sentinel-2 would need to record 285 full scenes to match this which would mean nearly doubling the current rate considering the partial coverage scenes. Generally the wider viewing angle has the advantage of providing larger uninterrupted images and the disadvantage of possibly less accurate data at the edges as mentioned in my analysis. It has however also the disadvantage of being more wasteful both with regards to water coverage (which is usually not of interest) and cloud cover. If the image size you record is smaller you will – assuming equal quality of weather based scheduling – be able to achieve a smaller average fraction of cloud cover since you can more specifically target cloud free areas. This also has to be considered when talking about coverage and revisit frequency. You can see several points above that could easily be changed by ESA/USGS putting more effort into things – USGS primarily in the ease of access (transparent, documented download API) and coverage (use of the Landsat-8 off-nadir capability to extend it), ESA in the whole public data access system, structuring and packaging of the data, clarifying their license terms and in working out an efficient acquisition plan that makes good use of the available resources and that ensures good global coverage (i am not sure if their current plans include any weather based short term scheduling variations). 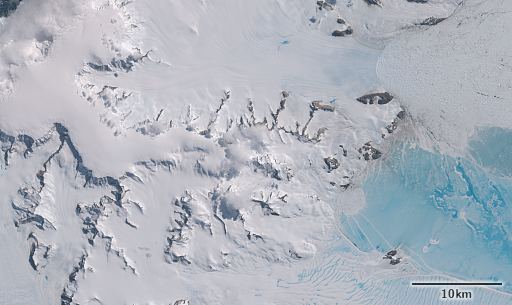 Here for those who would like a nice image for printing or as a desktop wallpaper a larger full resolution view from Sentinel-2 of the Antarctic peninsula – you may use it under CC-BY-SA conditions.